I've mentioned before my limited disdain for the Subaru Outback, because it essentially killed the Jaloptastic Legacy wagon. The Levorg is supposed to be a blend between the Legacy touring and the old WRX sportwagon. 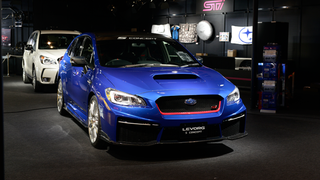 At the Tokyo Auto Salon, Subaru revealed the Levorg S Concept, with even more go fast goodies. According to WorldCarFans, Subaru gave the Levorg S Concept the "STi treatment" by adding: front fender vents, 19-inch BBS wheels wrapped in Michelin Pilot Super Sport tires, carbon fiber mirror caps and roof, strut tower brace, beefier brakes and a sport-tuned suspension with revised shocks and springs. Power comes from a 2.0 liter turbo-charged flat-four, mated to a 6-speed manual transmission. The S Concept adds a high-performance air intake and a sports exhaust system for even more bark and bite. As predicted, there are no plans to bring the Levorg stateside and seeing it just makes me miss my old Subaru LGT wagon even more. But in a strange plot twist it seems that Opponaut sampsonite24 may have spotted my old Subie that is currently for sale. I'm not 100% sure, but it is the same year, same, color and has the same aftermarket shift-nob. I called the dealer to send me a copy of the CarFax. I think it is fair to say that now Subaru has sold a half-million cars they can afford to take a chance and throw us a bone with a hot wagon.